Riv. 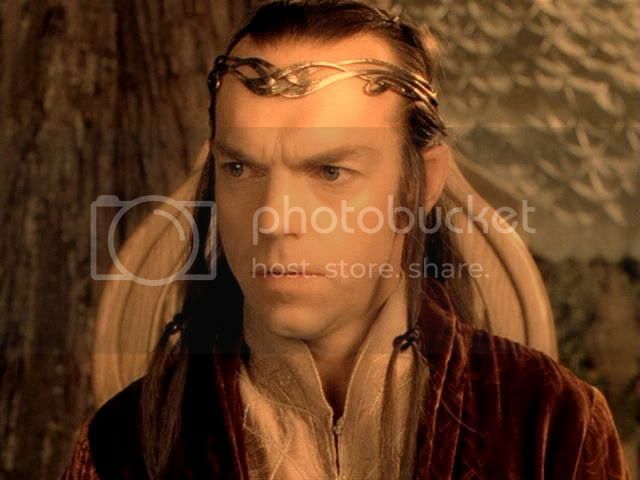 8 ~ Council of Elrond 2: ‘Never Trust an Elf!’, plus 'Rivendell Suite 5'. 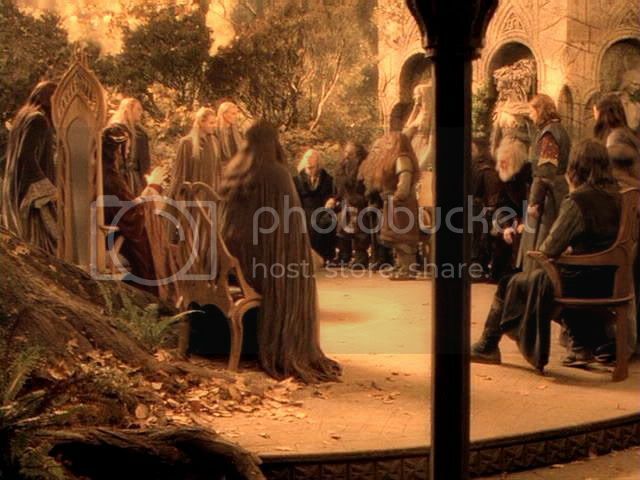 Reading the book scene again, I realise how much I miss the presence of Bilbo in the film’s Council of Elrond. I can see why they struck him from the scene, and it worked, since it served to accentuate Frodo’s relationship with Gandalf. In the book scene, Bilbo is sitting beside Frodo when Gandalf (not Elrond) issues the command to bring forth the Ring. By giving the line to Elrond, Gandalf is freed to sit beside Frodo at the critical moment when he is called from his seat, enhancing our sense through sheer visuals (physical proximity, looks, gestures) that Gandalf is Frodo’s special friend and helper. And this makes sense because it is Gandalf, not Bilbo, who is going on the Quest, and will be a vital character for the rest of the trilogy. 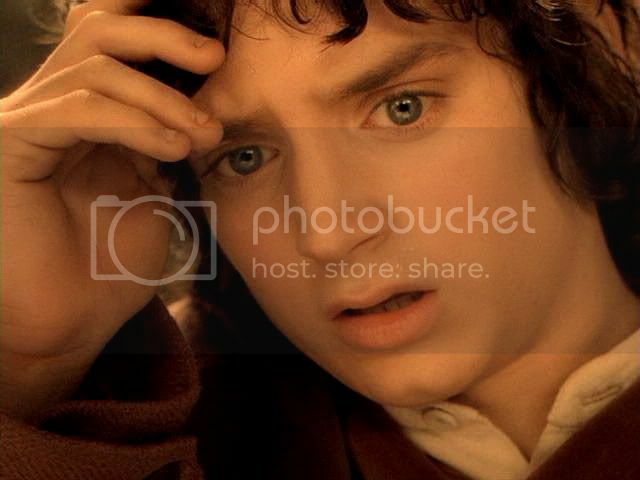 But if the filmmakers had known that in a few years they would be filming The Hobbit, would they have written the Council of Elrond scene differently, leaving Bilbo in the scene? 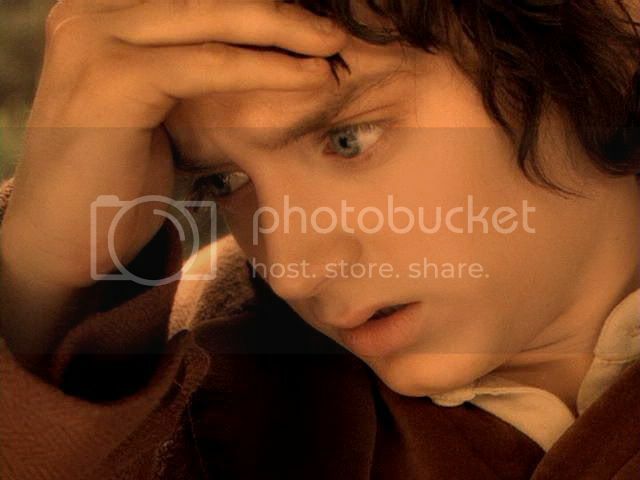 Bilbo’s presence would have made a strong connection between the films, because Bilbo in the council scene is still recognizable as the Bilbo who went to the Lonely Mountain, demonstrating himself as a surprising hero. 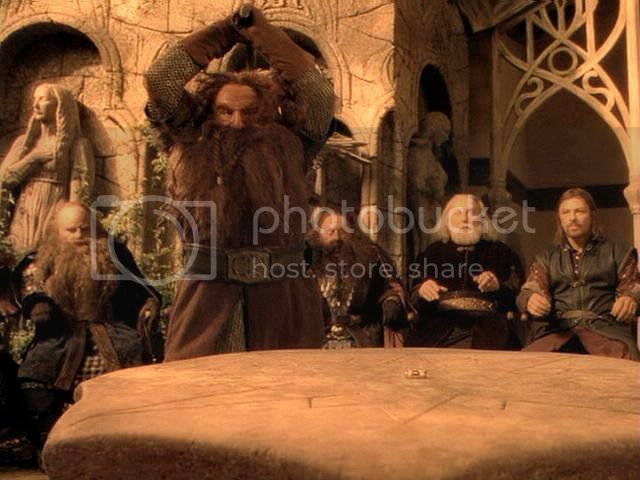 The council scene shows Bilbo’s fine points very clearly. 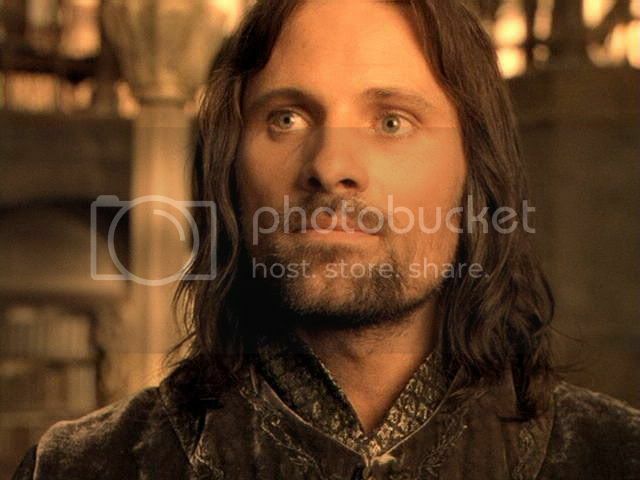 He speaks up to support Aragorn when he thinks Boromir is slighting his noble friend. Then he volunteers to take the Ring to Mordor. 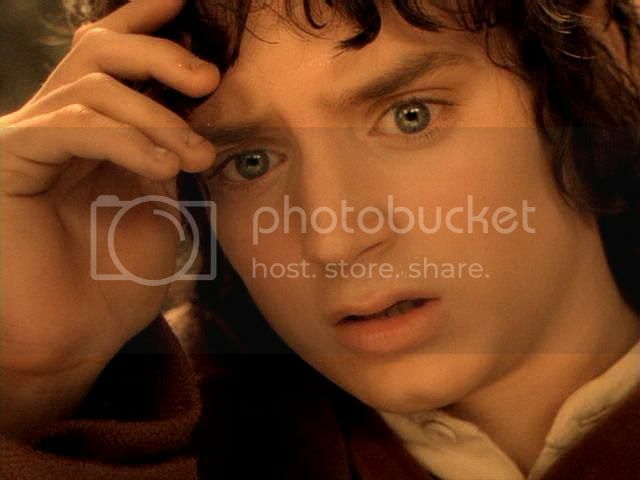 The reason, Bilbo reveals later in The Ring Goes South, is so that Frodo wouldn't end up having to go. 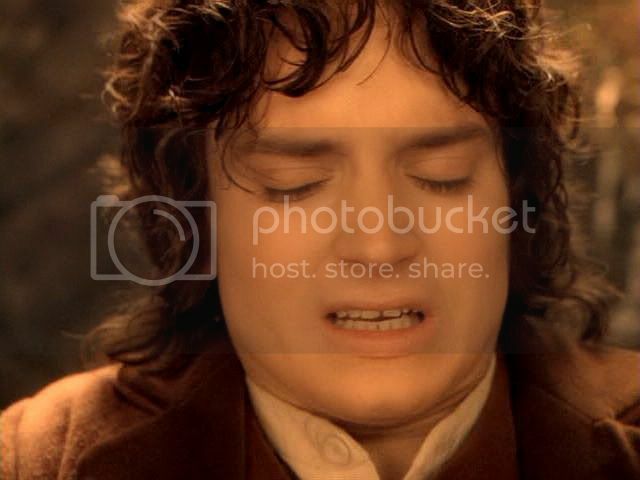 The council scene, and Bilbo’s other material in the Rivendell chapters, is full of moments that offer peeps at his loyalty, valour, resourcefulness, wit—both sardonic and self-deprecating—and his sheer hobbit pluck. The films don't really give much sense of the Bilbo Gandalf thought so superlative, or the Bilbo who came to earn the respect of Lord Elrond. 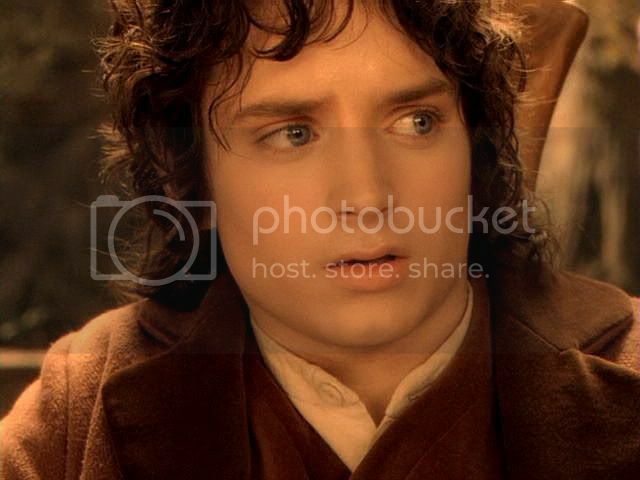 At the council, after he listens to Frodo’s tale, Elrond says, “I have known few hobbits, save Bilbo here; and it seems to me that he is perhaps not so alone and singular as I had thought him.” This is a tremendous compliment to Frodo, a compliment based on the esteem Elrond already feels for Bilbo. In the film scene, it is Legolas who is given Bilbo’s job of leaping up to defend Aragorn’s honour. Legolas's featured moment in the book, bringing the report of Gollum's escape from Mirkwood, doesn’t make it into the films. Legolas has already been singled out in the minds of viewers by giving him a healthy close-up during his arrival (and what a dashing arrival it is). But by giving him this part of Bilbo's material, the screenwriters further mark him as a staunch ally of Aragorn. Gandalf is given Bilbo’s other job at the council, that of standing by Frodo. Doing this helps highlight Frodo and Gandalf’s special relationship, but also, once Gandalf enters the fray to deal with the tumult caused by Gimli, Frodo is left by himself to respond to the scene. No one is sitting by him as he watches the heated wrangling fomented by the Ring, hears the Ring’s insidious whispering, and is finally driven to stand and shout out his offer to go. 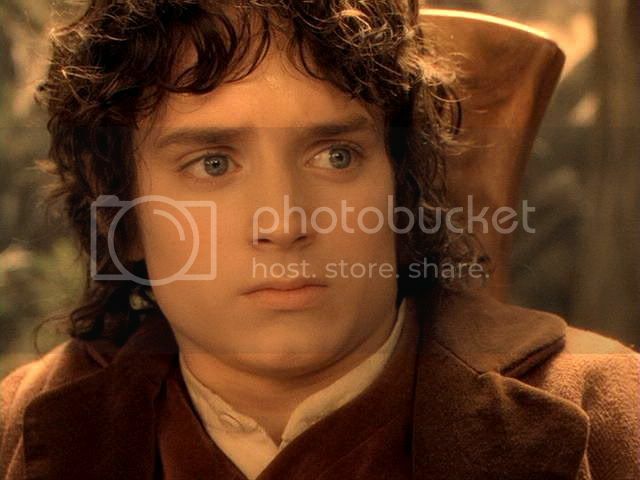 Isolating Frodo at this crucial moment helps focus the viewer that much more closely on the dynamics of his decision, and on the loneliness of his decision. So even though the scene is changed by removing Bilbo, the scene is still faithful to the larger story. I always love watching this scene, it’s so splendidly done: the writing, the acting, the golden lighting, the superb score, the fabulous set: the whole works. But my ideal version would preserve these things and restore Bilbo to the proceedings. 'Behold Isildur’s Bane!’ said Elrond. ‘Not very good perhaps, but to the point—if you need more beyond the word of Elrond. If that was worth a journey of a hundred and ten days to hear, you had best listen to it.’ He sat down with a snort. The change in the wizard’s voice was astounding. Suddenly it became menacing, powerful, harsh as stone. A shadow seemed to pass over the high sun, and the porch for a moment grew dark. All trembled, and the Elves stopped their ears. ‘Never before has any voice dared to utter words of that tongue in Imladris, Gandalf the Grey,’ said Elrond, as the shadow passed and the company breathed once more. ‘And let us hope that none will ever speak it here again,’ answered Gandalf. 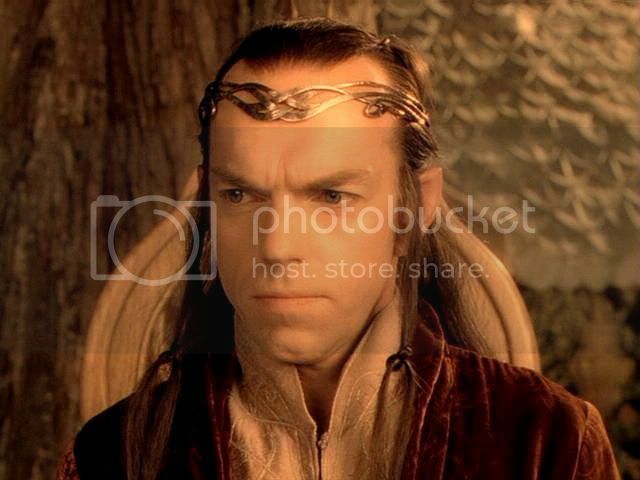 ‘Nonetheless I do not ask your pardon, Master Elrond. For if that tongue is not soon to be heard in every corner of the West, then let all put doubt aside that this thing is indeed what the Wise have declared: the treasure of the Enemy, fraught with all his malice; and in it lies a great part of his strength of old. [Gandalf then recites the translation, “One Ring to find them…”, going on to tell how Gollum was given into the keeping of the Elves of Mirkwood. 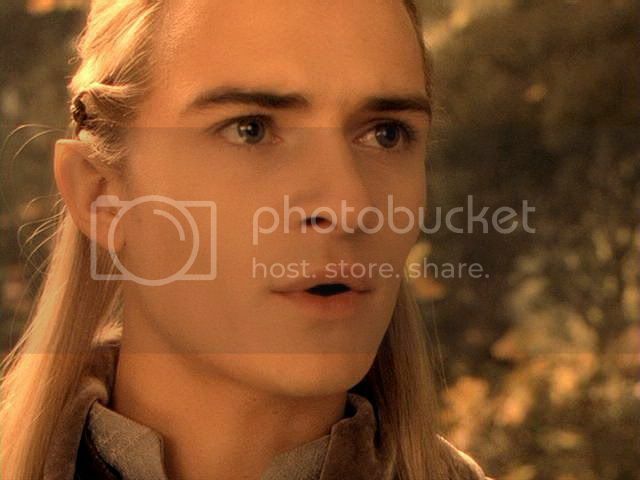 Legolas confesses that, alas, Gollum was rescued by orcs! 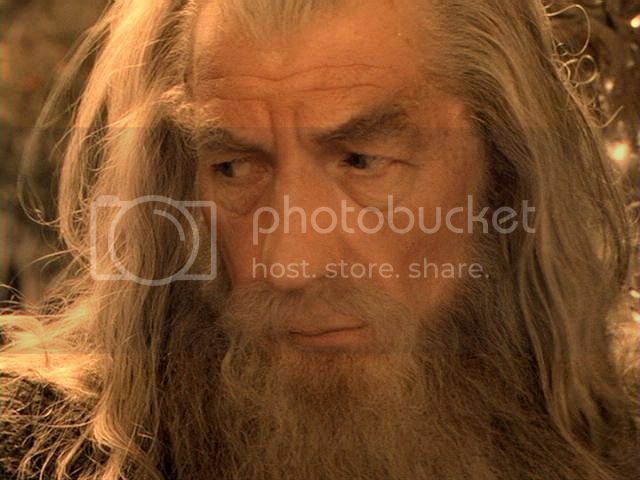 All are dismayed, but Gandalf keeps the tale going, telling how he met Radagast the Brown, who warned Gandalf of the Nine, then of his meeting with Saruman and subsequent imprisonment on the top of Orthanc. 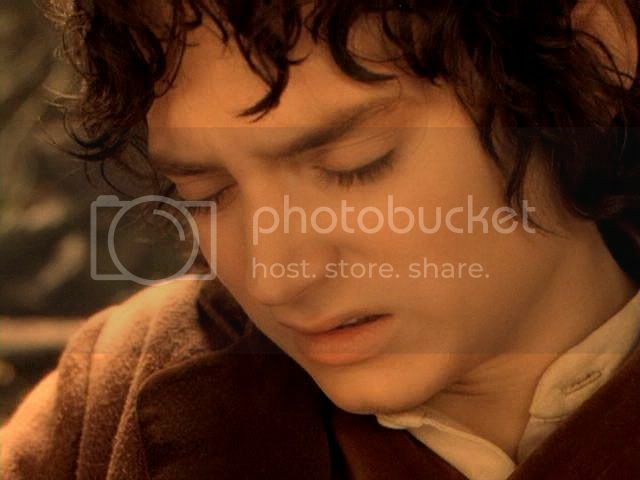 “I saw you there!” Frodo interjects, and tells of his dream. Gandalf expresses his astonishment at this, but presses on. Continuing, he tells of his rescue by Gwaihir and the procuring of Shadowfax in Rohan, of his journey back to the Shire, where he finds the hobbits have left, and of hurrying to Bree to discover Barliman's perfidy: the 'run-off-his-feet' inn-keeper has failed to send on Gandalf's letter, urging Frodo to leave the Shire immediately. Gimli: What are we waiting for? 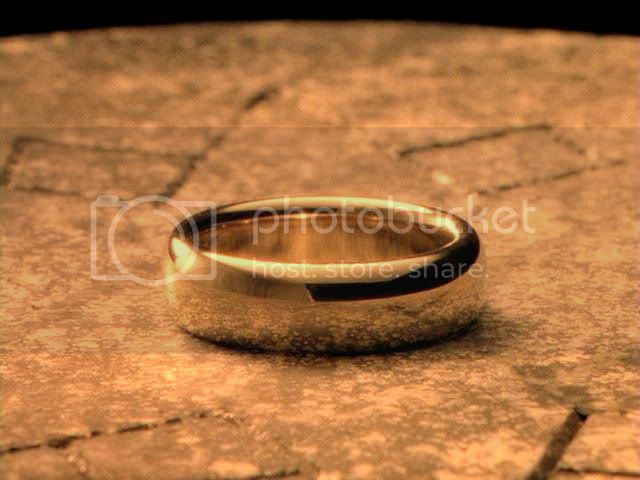 Elrond: The Ring cannot be destroyed, Gimli, son of Gloin, by any craft that we here possess. 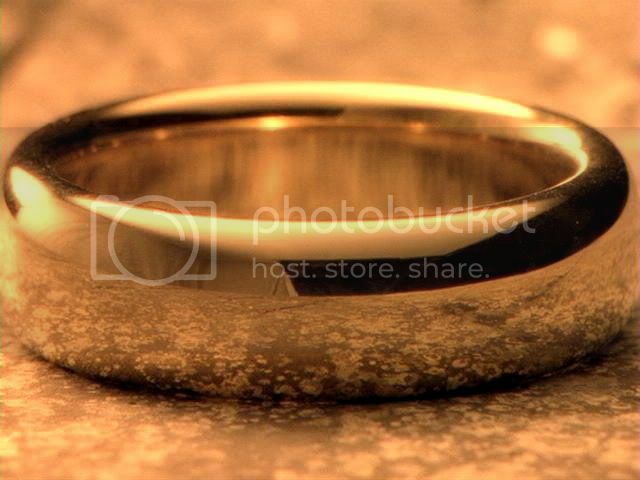 The Ring was made in the fires of Mount Doom. Elrond: Only there can it be unmade. It must be taken deep into Mordor, and cast back into the fiery chasm from whence it came. 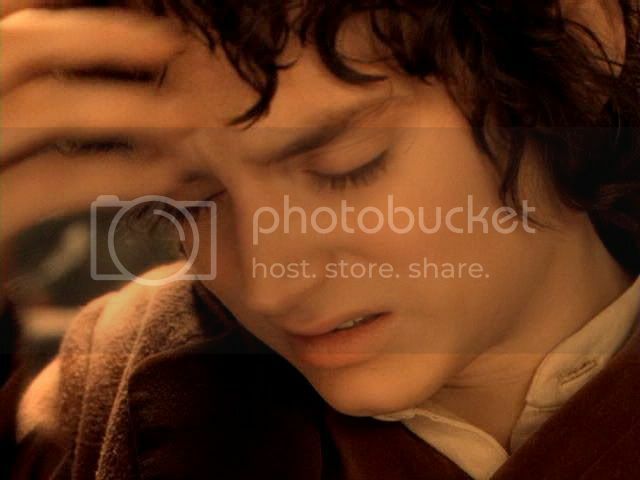 As the whispering subsides, Frodo begins to withdraw his hand from his forehead. Elrond: One of you must do this. 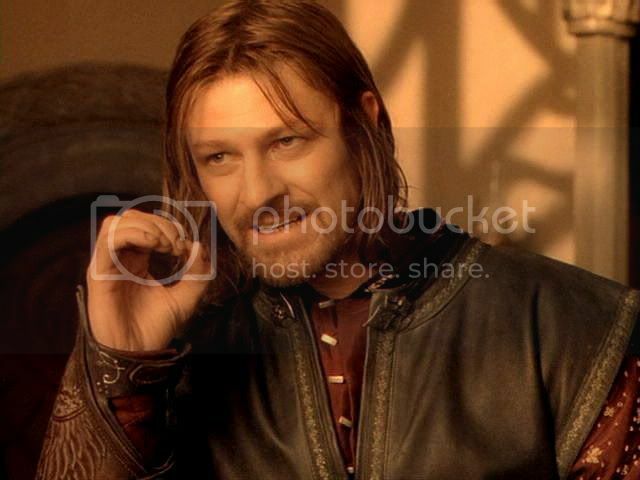 Boromir: One does not simply walk into Mordor. Its black gates are guarded by more than just Orcs. There is evil there that does not sleep. And the great Eye is ever-watchful. It is a barren wasteland, riddled with fire and ash and dust. The very air that you breathe is a poisonous fume. Not with ten thousand men could you do this. It is folly. 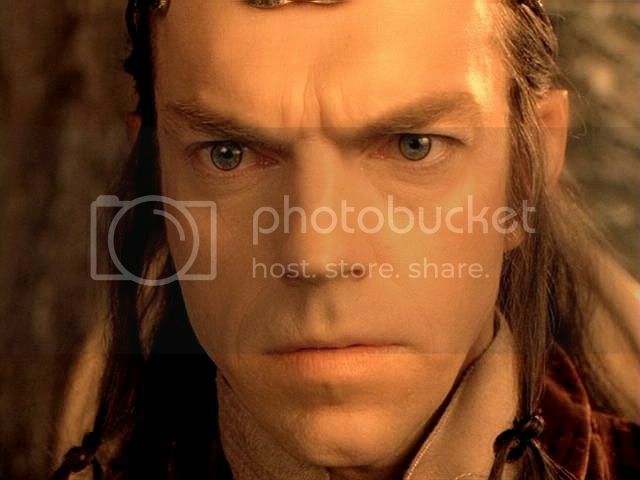 Legolas: Leaping up: Have you heard nothing Lord Elrond has said? The Ring must be destroyed! Boromir: Rising: And if we fail, what then? What happens when Sauron takes back what is his? Gimli: I will be dead before I see the Ring in the hands of an Elf! Gimli: Never trust an Elf! fleeing before the angry breath of the Sea. led us to this fated day? call out to your Master. The filmed scene of COE, while filled with beauty, nevertheless frustrated me, making me long for the restoration of book passages that were changed or even omitted for the sake of expediency. In this poem, I hope to redress one such omission. In the EE version of FOTR, Boromir is given part of his book speech: "In a dream, I saw the eastern sky grow dark. But in the West a pale light lingered. A voice was crying, "Your doom is near at hand. Isildur's Bane is found." But he is not given the rest of it, the riddle, the verse-prophecy that mentions the "Halfling" that "forth shall stand". If he had, the dynamic between Film Boromir and Film Frodo, to my mind, would have been altered (as well as the dynamic between Boromir and Aragorn). Boromir would have realized that *this*, the hobbit standing before him, was the Halfling long foretold, and not just some short fellow of little import who held, by mere 'chance', a Very Important Trinket. * "Hope", Estel, is the name given to Aragorn by Elrond at the time of his fostering. In an earlier draft of LotR, (The History of Middle-earth, vol. IX, Sauron Defeated: "Many Partings," p. 62), Gandalf names Frodo Bronwe Athan Harthad, "Endurance beyond Hope". ~ Riv. 7: Council of Elrond 1 – ‘Bring forth the Ring, Frodo’, plus jan-u-wine's "Rivendell Suite 4". Oh, I missed seeing this earlier! The Council is my favorite scene in FOTR, and I wish it had been much longer. I love seeing it this way. I'm glad you enjoyed it, Shirebound. I agree; it's such a good scene. 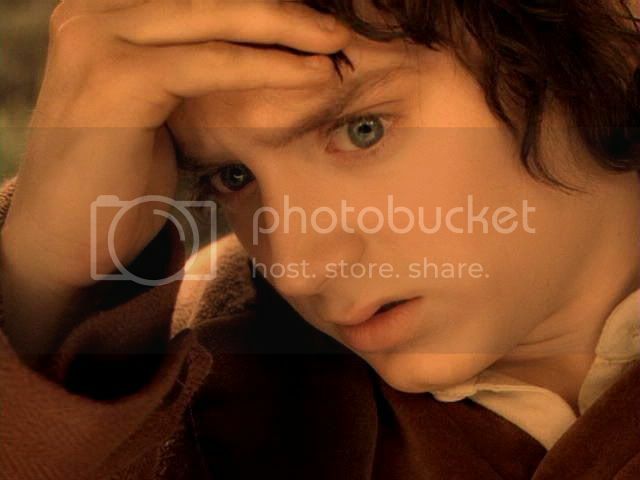 I agree with you; I was a bit disheartened the first time I watched FotR to see that Bilbo wasn't at the Council. But as you say, the way they did it probably served the film's purpose better. Thanks for your really insightful analysis! It was a pleasure cogitating while I prepared these posts, Telstar. Thanks for commenting! I love Frodo's reaction as Gimli's axe strikes the Ring. It's as though he feels the blow physically, as if the hard-edged blade had cleaved his own flesh and bone. He looks nauseous as the Ring whispers, beads of perspiration visible on his upper lip and forehead. Elijah is terrific in this scene. I would have liked Bilbo at the Council too, though I agree the scene works well as filmed. Gorgeous screencaps as always. Thanks Mechtild. I love EW's performance of the reaction (to the Ring being struck), too. He's just so vivid. And, yes, Sean Bean's delivery *is* great - only slightly marred by the LotR comic spoof that starts off with the clip of Boromir beginning this speech, lol. I haven't been here for a while, drowning as I am in grad school and my 'day job', but a fair zephyr whispered that something lovely was here, and I am so glad that I came to read it, and to see the screen-caps, and to look around. SOME DAY... I do not know when, but SOME DAY you two are going to get some sort of serious recognition for the consistently high quality of the work here: the essays, the screen caps work, and the poems. And if the recognition comes when you are very old (or, after you've passed into the next life), then it will be greater recognition yet, since we all know that (for some odd reason), artists are always praised the most after they have shed this mortal coil. But hopefully THAT event will be quite a few decades hence, for all of us. 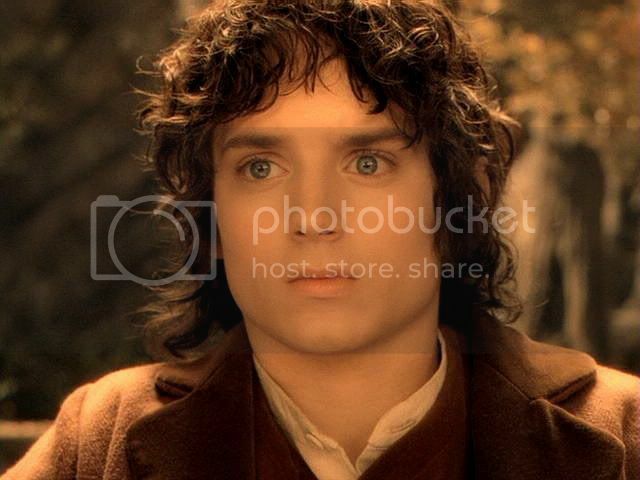 There were some new insights into the film (how Gandalf's role as Frodo's friend on the Quest to come is being highlighted in the Council scene.... how very alone Frodo really is when he stands up to shout out that he will take the Ring... dearest Frodo. He is so brave. He is still such a great inspiration to me! 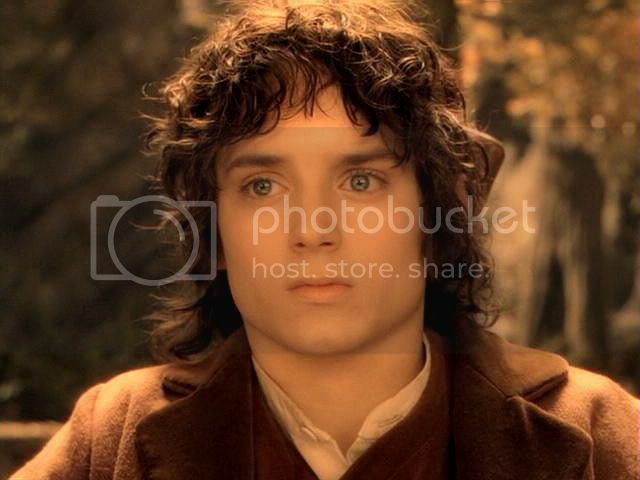 Bilbo is wonderful, too, and Frodo takes after Bilbo -- and I wish too that B. had been featured in the film scene as he was in the book scene... but Frodo is Frodo. You know? I run out of words, like I did just there. I get very un-eloquent (even to the point of making up nonexistent words, lol). I'm so glad you've been liking the Rivendell series, Mary. And how rash of you to come out from under your workload to comment! The Rivendell series (which started with the scene of Frodo waking up) will be my last screencap series except for Galadriel's Glade. Or it probably will be. 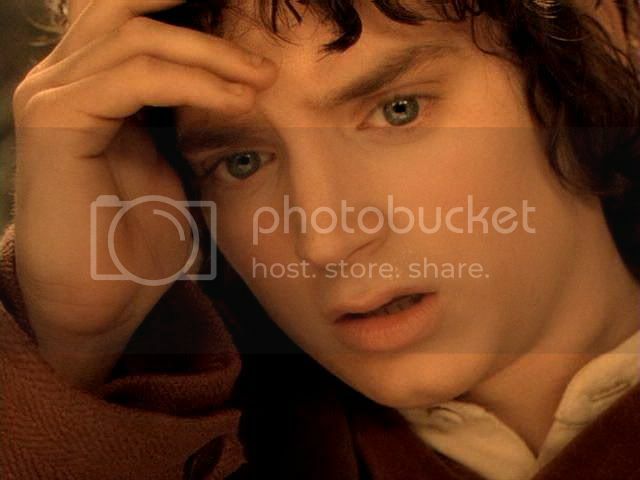 It's the biggest Frodo-concentrated piece of the film I still haven't screencapped (except for the Farewell, which I capped on its own a year or two ago). You are very faithful, Mary, to cheer us on like this. We appreciate it so much. But that's how it is, looking at Frodo in these scenes, thinking about him in the book, reading Jan's stunning poems: a fan can't help it. Jan's been writing some new poetry for this series (Rivendell Suite, which has four parts so far), but I also have featured poems she's already written (Pts. 1, 2, 6, 9 - 12). You'll love browsing them. Again, thanks for stopping, Mary. You're the greatest! 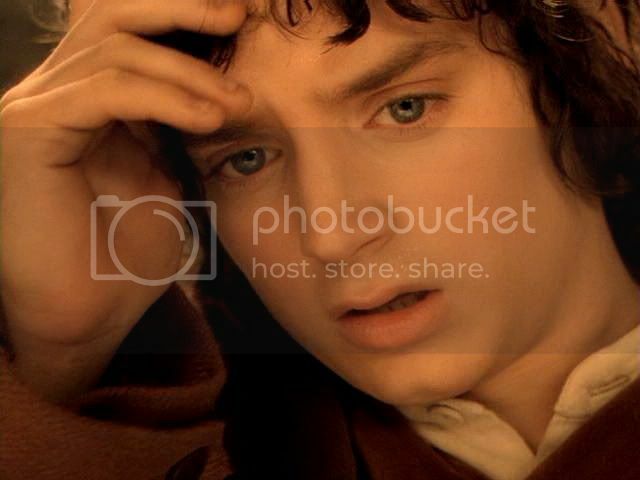 It is not in these captions but you know that Gandalf is aware of this. He sees it. You're right. 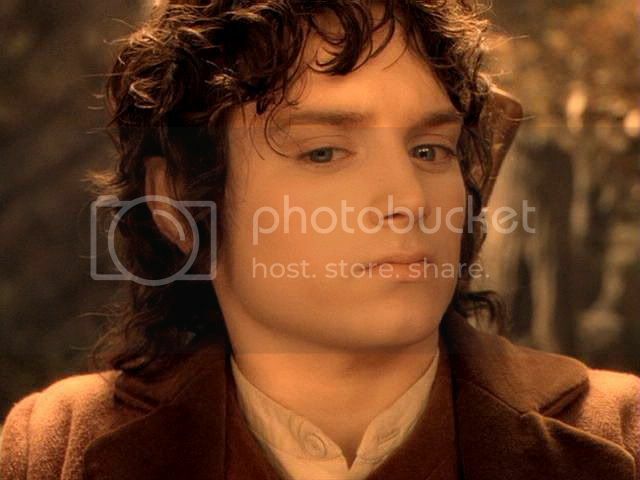 There's only one cap of Gandalf glancing worriedly at Frodo (right after Frodo puts his hand to his forehead), which has had to stand for a longer, more piercing look, but that glance establishes so much for the viewer. Gandalf notices, Gandalf is concerned: something Big is going on inside Frodo. EW really is ultra-convincing and in character in this moment. 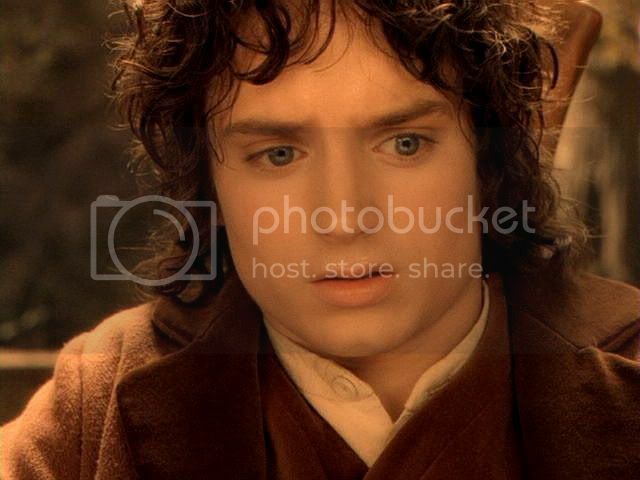 His performance always impresses me, even when he has to play scenes and say lines that I wish they hadn't given Frodo, but this is a moment that makes me say, "how could he *do* this, at his age????" He conveys so much, such viscerally felt emotions here, the viewer feels the impact of the Ring with him. I was *gobsmacked* when I saw ROTK and realized what he had done in his progressions of this character. As I've learned more about the making of the films (Sibley's recent book on PJ was great for this), I've become even MORE impressed by the work EW did. They shot so much out of sequence, shot so many scenes that got tossed and were replaced with others, not necessarily with much idea how they fit in with the larger story, it's amazing EW and everyone else produced the character through-lines they did in such a huge project. It's a tribute to the degree of trust the actors (and crew) seemed to operate out of to get the films accomplished. I suppose they didn't have a choice, of course, but to cooperate, but the annecdotes suggest that most of them did it with grace and and a high degree of dedication. I agree with your feelings here. I became aware that they did so many out of sequence. In some cases, such as, I think, after Gandalf dies and you see *that* look of such extreme sadness on Frodo's face, Ian wasn't there. He hadn't joined with them yet. 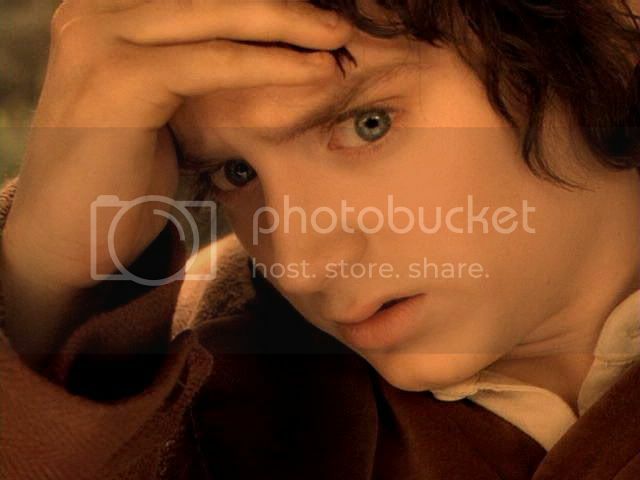 But that look Elijah brought out of Frodo broke my heart into a million peices. It relayed so much pain that it was hard to look at almost. Do you mean his "Nooooo!" 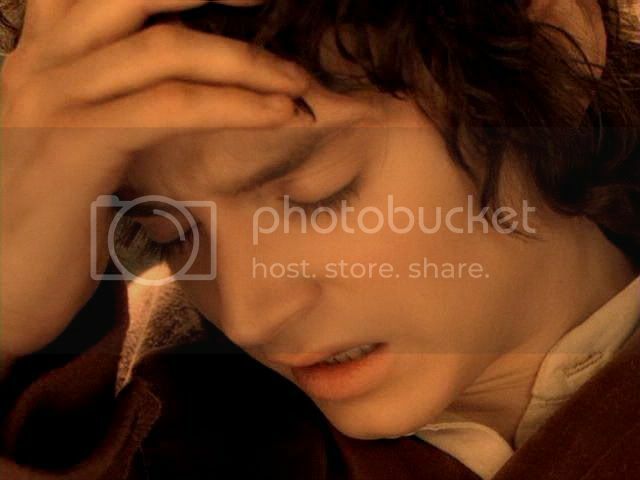 look of shock and grief when Gandalf falls, and he has to be held back? If so, that was a pretty super bit of acting. He was terrific. But so much that the actors did that I admire in the films turns out to have been acted to an assistant director or someone else reading the other actor's part, or in front of blue screen with only PJ or Fran telling them what they're supposed to be seeing and feeling. They really do make *magic*, don't they? Boromir would have realized that *this*, the hobbit standing before him, was the Halfling long foretold, and not just some short fellow of little import who held, by mere 'chance', a Very Important Trinket. Just reading this gave me goose-bumps. I’m sure that if this scene and ancient verse, was included in the film I’d have been a goner. Thank you Mechling and Jan. A very Happy Christmas to you both. Wasn't that great, Estë? I only added it to the post (the poem and its author's note) the day before yesterday. The Muse visited Jan late, but what a visit!!! !